…or something to that extent. 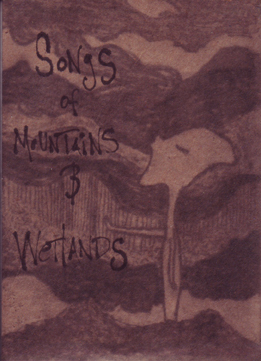 If you’re still with me after that particular rant, then Songs of Mountains and Wetlands might right up your alley. Imagine songs inspired by nature and transitory environs, composed on custom software and analog electronics tuned to seven-limit just intonation – hyper-compressed and oversaturated to the point where all aspects of delicacy have been smoothed away into a wash of fuzzed-out static – where the smallest sound is grandiose in a post-Bruckheimerian, digital neo-Wagnerian spectacle. Where even the mundane deserves it’s own twenty-minute explosion-sequence.